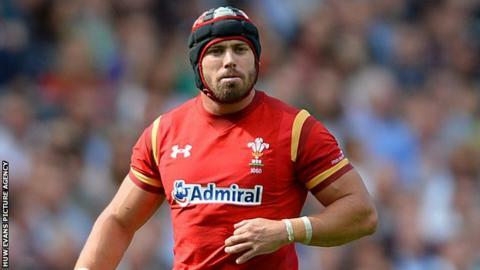 Scarlets head coach Wayne Pivac says Wales full-back Leigh Halfpenny will not be joining the region next season. Halfpenny is free to leave Toulon in the summer and Scarlets were among the clubs linked with the 27-year-old. But Pivac accepts Halfpenny, who joined Toulon from Cardiff Blues in 2014, will remain in France for a third season by accepting the option of another year. "He's staying at Toulon this year, what he's doing after that will be up to Leigh," Pivac told BBC Wales Sport. Scarlets and Halfpenny's previous team Cardiff Blues both expressed an interest in bringing him back to Wales, with financial support from the Welsh Rugby Union. Wasps were also in the market for him, but director of rugby Dai Young admitted in December they were out of the running. Toulon coach Bernard Laporte has said he expects Halfpenny to stay for the optional third year of his contract. "That's common knowledge, isn't it?" said Pivac. "He's not with us for 2016-17." The Scarlets coach said it was too soon to talk about where British and Irish Lions back Halfpenny might play the following season. Halfpenny will not be included in the restricted number of players based outside Wales available to national head coach Warren Gatland, because he is continuing with an existing contract. Scarlets look set to lose Wales tight-head prop Rhodri Jones, who has been linked with a move to the neighbouring Ospreys. The 24-year-old has to compete with Wales' current first-choice Samson Lee at Parc y Scarlets. New Zealander Pivac admitted it was difficult to satisfy two international players in the same position. "His contract is through to the end of the season and that's as far as the discussions have gone with us," Pivac added. "We've talked to him about a possible extension, but that hasn't happened at this stage. "If I was in his shoes, coming out of the shadow of Samson would definitely be an option, so it's something he has to think about." Wales full-back Liam Williams is back training with the Scarlets' squad and remains on course to feature against Connacht on 30 January, a week before the Six Nations starts. Williams, 24, has not played since a reoccurrence of an ankle injury during the World Cup in October. Scrum-half Aled Davies, lock/flanker Lewis Rawlins, wing Tom Williams and flanker Will Boyde are all available again after injury. Scarlets face Northampton Saints in their final European Champions Cup group match on Saturday having lost all five games in this season's competition.